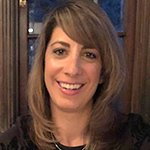 Sanaz Saatchi is the Co-Founder and Partner of CrownPoint Medical (CPM) which provides strategic services that accelerate healthcare innovation and commercialization. CPM works at the intersection of R&D and Marketing to help clients understand the product-customer interface and product-market fit. CPM focuses on discovering unmet needs and design thinking, voice of the customer and customer needs, user-centric design, human factors, market assessment, and go-to market and commercialization strategies. Previously, Sanaz was an Engineering Program Manager and Marketing Product Manager at Medtronic. She led a global research effort that launched a portfolio of 5 cardiovascular medical devices. She led a cross-functional and multi-company team through needs finding, product development, and commercialization of 2 of these devices. Sanaz holds a Ph.D. in Bioengineering from Stanford University, a M.S. in Mechanical Engineering from MIT, and a B.S. in Bioengineering from UC Berkeley.